That Was Then… B&W 602 S3 review | What Hi-Fi? 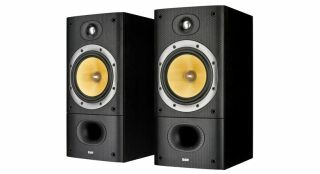 It’s probably fair to say that even when B&W’s 602 S3s were first introduced in 2002 they were something of a dinosaur. By then, speaker design had long gone down the ‘smaller the better’ path, and slimmer proportions were most definitely in. In contrast these bruisers were huge, standing almost half a metre tall, and featuring the kind of mid/bass driver that wouldn’t look out of place in a decently sized subwoofer. It took no less than eight bolts to hold that driver in place. The clear suggestion was one of power. Yet, the ability to get furniture rattling wouldn’t be anywhere near the whole story; these speakers turned out to be far more talented than that. Our first review in March 2002 talked of unfashionably large cabinets, and how sales would be low compared with the 600 range’s more compact offerings. This turned out to be true enough, as B&W’s engineers turned to smaller solutions such as the 685s for subsequent ranges. Now, having spent some considerable time with well-preserved samples of the 602 S3 – B&W’s own reference units no less – we can’t help but feel that’s a bit of a shame. Talking to company insiders we get the sense that there’s still a lot of affection for the old brute, and not just rose-tinted nostalgia either. There are some solid engineering reasons for the speaker’s appeal. Using a large driver in a generous cabinet volume makes it easier to deliver high volume levels, strong dynamics and good low-end extension. Smaller speakers can’t do these things as naturally, so need far greater engineering effort to compensate (or at least attempt to). The 685s (both original and current S2 models) are an obvious attempt to repackage the 602s’ virtues into a more domestically acceptable form. At 34cm tall, by current standards even these are considered large, but next to the old timer they look pretty dinky. Move away from size, and the engineering similarities between the 602 and 685 are striking. It speaks strongly of B&W’s consistent and evolutionary approach to speaker design. Both are two-way designs using 25mm aluminium-dome tweeters coupled to Kevlar mid/bass units. Both also have a front-firing dimpled reflex port to tune the low-end performance. While the two products share much, it doesn’t take long to find signs of progress too. Build standards on the newer speakers are far higher. Cabinet edges are crisper and the quality of wrap – still vinyl, mind – is nicer. Finish options for the old timer were black ash, oak and Sorrento, while the new one is limited to black or white. Fit and finish are more precise on the 685, with the front baffle lining up with the outer panels more convincingly. Those on the older product are surprisingly uneven in comparison – standards really have improved in this respect. The 602s still feel solid though, and weigh in at a hefty 3kg more apiece. Take the earlier speakers apart and the care taken in designing the drive units is impressive. There’s the tapered tube arrangement behind the tweeter that B&W still uses today, while the mid/bass driver’s almost sculptural metal frame looks lovely in its minimalism. Take a look at the spec sheet and the frequency response hasn’t really improved over the years. The 685 S2s claim 52Hz – 22kHz within 3dB limits, while the (larger) older speaker delves a further 3Hz in the bass and has the same upper limit. The advantages of using a more generous driver and cabinet arrangement also show through in the sensitivity ratings, with the 602 S3 achieving 90dB/W/m – a whole 3dB better than the current design. This makes a significant difference with lower power amplification, where the earlier design will be notably louder for any given signal. Specs are one thing, but start listening and it’s clear that affordable speakers have evolved considerably. Despite similar ingredients, the 685 S2s prove that B&W’s engineers haven’t been sitting on their hands in the intervening years. The newer boxes are better just about everywhere. We play a bit of Tchaikovsky’s 1812 Overture and it’s clear that they’re considerably more detailed across the frequency range. Though the tweeter designs share much in terms of engineering principles, the ones in the 685 S2s are crisper, more refined and notably more textured in their output. In comparison, the 602 tweeters sound surprisingly ‘one note’ and clearly lack subtlety. Tonally, the older speaker sounds brighter, verging on edgy with slightly aggressive recordings. Stereo imaging, and the speakers’ ability to layer a sound stage are significantly different too. Once again, the new model sets the standard here, making the 602s’ imaging skills appear limited and squashed in terms of depth. Likewise, the older model doesn’t communicate rhythmic patterns with any great precision. Despite being notably inferior in many areas, the 602 S3s are still way too good to be written off. With the Tchaikovsky recording they deliver an impressive dose of scale and authority. Those generously sized drivers and cabinets pay off handsomely. Dynamically they shine too, going from loud to quiet and back with considerable grace and ease. In comparison the newer model – while probably having wider limits – seems to have to work harder for the same result. Push the volume levels up and the 602s retain a degree of composure for longer than we expected. Play Massive Attack’s Angel and the S3s respond with enthusiasm. They have a lively balance and plenty of punch. We’re impressed with just how well low frequencies are delivered – there’s plenty of agility combined with punch – which leaves the newer speakers sounding just a touch thick in comparison. The 602 S3 may not be flawless but they remain great fun to listen to. Comparisons show that current speakers have taken huge strides forwards in many respects, particularly resolution and refinement, but we still can’t help but admire what these big old standmounters can do. If you can find a pair in good working condition we think you’ll love them too.